Each week, Voice of Russia hosts Red Line, a discussion about global events as seen from Moscow. In this edition: Palestinian statehood and Nils Ushakov. Ekaterina Kudashkina: This week we will start by looking into the 66th U.N. General Assembly, which took place in New York with tensions running high over the core Palestinian issue. Palestinian leader Mahmoud Abbas is fully determined to seek UN recognition of the Palestinian state, and Israeli Prime Minister Benjamin Netanyahu is fully determined to stand against it. In our first section, Beyond the Headlines, we will try to understand how relevant those fears are and whether there is still room for diplomacy to intervene. In our second section, Between the Lines, we will discuss different approaches to the issue as seen by former Israeli Prime Minister Ehud Olmert and Gareth Evans, a former foreign minister of Australia who was actively involved in negotiating the Oslo accords. In our final section, Face in the News, we will talk about Nils Ushakov – the 35-year mayor of the Latvian capital, Riga, a leader of the “pro-Russian” Harmony Center party, and a rising star in European politics. So, the Palestinians cause another surprise at the UN, although, of course, it was not a surprise. We discussed this on our program some time ago. Sergei Strokan: I remember that discussion, and we came to the understanding, that by crossing this Rubicon on the issue of Palestinian state recognition, President Abbas pledged to make a breakthrough in a matter of weeks, not decades. Ekaterina Kudashkina: There could be some logic in this position. Abbas was sending Israel a clear signal: enough is enough. As far as I understand, Mr. Abbas was saying that the Palestinian bid in the United Nations doesn’t contradict the idea of continuing with negotiations. The procedure in the UN works like this: Mr. Abbas submitted the bid for UN membership to the UN Secretary General; Mr. Secretary General has to hand it over to the Security Council for deliberations; The Head of the Security Council convinces the commission that is going to look into the matter, and after some time it is going to decide whether to recommend it to the General Assembly that they take the matter for discussion and that they grant membership to the Palestinian authority. But the crucial thing to me is that there are no time limits between those stages, that allows for some maneuvering. Sergei Strokan: But don’t forget that regardless of the Security Council decision, there will be also deliberations at the General Assembly. And more than 140 countries have already voiced their support for Palestinian independence. However, Israel has warned that a unilateral recognition of the Palestinian state will never work. And there are mixed feelings in the United States. The Palestinians can be recognized by 140 or 190 countries, but if they don’t settle the dispute with their nearest neighbor, Israel, what sort of state it will be. Ekaterina Kudashkina: I think that the major issue is to internationalize the issue. Their point is that neither bilateral talks with Israel nor efforts from the Quartet have brought any tangible results. Now we have Mouin Rabbani, visiting Senior Fellow with Institute for Palestine Studies, with us from Washington. So what does the Palestinian side expect of this move? Mouin Rabbani: I think that if your question is about the leadership, I think their approach is to use this as a tactical maneuver to seek to improve the terms of any negotiations on the continued American sponsorship. But I think for many other Palestinians, the value of this initiative is precisely that it could help lay the basis for internationalization of the question of Palestine. What you have had now, basically for 20 years, is the diplomacy that has had one and only one sponsor, and namely the United States. What internationalization means is that taking the Palestine question basically away from this American diplomatic hegemony and returning it to the United Nations. Sergei Strokan: I think we have to agree that what they can expect is nothing more than a moral victory, moral support, and still this victory is questionable, as it is not recognition itself that matters, but what matters is solving core issues of the conflict, like the refugee problem, or border problem, or the question of the status of Jerusalem. And General Assembly is unable to solve those issues. Though many say that Palestinians have to negotiate it with Israel. You cannot change your neighbor, and the first thing you have to do is to come to terms with your neighbor. But also the echo of those deliberations in New York came to Moscow. We also have here a strong pro-Israel lobby, and at the same time we have very motivated groups of those who support Palestinian state. This week activists from Russian Jewish organizations were protesting near the walls of the Palestinian Embassy, saying unilateral recognition is a road to nowhere. I think this is more that just an outcry. It shows that it will be extremely difficult for a newly born Palestinian state to survive. Initially it was expected that the Security Council will look into the matter within weeks, and by the end of the year there will be a Palestinian flag in the United Nations, but this is not the case anymore. I think that U.S. President Barack Obama is deeply disappointed that all his attempts to bring both sides to negotiating table have failed. I understand his logic, because it seems that he has no option other than to use his veto right in the Security Council. Some say that such move will give him more votes at the next year presidential election as there are a lot of fans of Israel in the United States. Ekaterina Kudashkina: But that makes the position of the United States even more vulnerable as a mediator in the conflict, because a mediator should be absolutely impartial, it should be non-partisan. And using his veto will also have serious side effects for Obama both at home and abroad. Sergei Strokan: In the United States, he can expect to have more votes from the pro-Israel lobby. However, the veto will seriously undercut the U.S. position in the Middle East, where there is overwhelming support for the Palestinian independence. Ekaterina Kudashkina: What is the alternative to a veto? Sergei Strokan: Well, some experts say, that Obama should preempt the Palestinian bid for UN membership by introducing his own resolution at the Security Council. I believe the world community needs a resolution on the Palestinian issue that will not divide the world, but garner wide international support. I believe that there are few crucial points that should be reflected in such document—the first point is that the future border between Jewish and Palestinian states should be established on the basis of the borders which existed before 1967 Six Day War. The second point is that both sides should agree on security arrangements in Gaza and the West Bank that will meet Israel's demands. The Palestinians have to take strict measures that will allow Israel, especially these border areas not to live under this sword of Damocles. Jerusalem also is a very difficult question, because how can you divide undividable? Israelis say there is no way to divide this “eternal city”, while Palestinians want East Jerusalem to become a capital of independent Palestinian state. But as for Jerusalem, there can be a solution: it can be a shared capital. And I think that they can agree that there should be no attempts of uprooting Israelis or Palestinian residents in the city as it will only rock the boat and agree that it will be a shared capital of the Israeli and Palestinian states. Ekaterina Kudashkina: That sounds quite fair to me, but once again, I think that at this stage this is not a negotiable solution. Nobody is going to talk on these terms. It needs to time, but we are running out of time, with the Arab Spring, with the rise of nationalism in the region, all across the region, both in the Arab countries and in Israel. I think that Mr. Olmert is reminding his readers what solutions he proposed back in 2008. He says that during his tenure as prime minister, the Israeli people expected him to present “bold political initiatives” that would bring peace and not arguments outlining why achieving peace now is not possible. Today, he says, such an initiative is more necessary than ever to prove to the world that Israel is a peace-seeking country. Sergei Strokan:So, as far as I understand, and as far as I remember, Mr. Olmert has been supporting the two-state solution – just like everyone now seems to be. Ekaterina Kudashkina:That’s right – he says the issue could be resolved by establishing a Palestinian state on territory equivalent in size to the pre-1967 West Bank and Gaza Strip, a step backwards compared to what you have been suggesting. Do you really think that suggesting sharing Jerusalem in a manner proposed by Mr. Olmert could work? Its Jewish areas, he is saying, would be the capital of Israel and its Arab neighborhoods would become the Palestinian capital. I am not sure that it is exactly a position that would be supported by the Palestinians. Sergei Strokan:Well, they never rejected it. This is something Mr. Olmert formally suggested in September 2008, three years ago, and there has been no formal rejection to it. Sergei Strokan:If we take the Palestinian stance, then it is not that simple, you see. Palestinians are also not united. Obviously there is the Hamas stance, and there is the stance which is voiced by President Abbas. In addition to that, Palestinians are influenced by Arab mediators. Ekaterina Kudashkina: I want your opinion on another piece by Mr. Olmert. He writes: “Because ensuring Israel’s security is vital to the implementation of any agreement, the Palestinian state would be demilitarized and it would not form military alliances with other nations. Both states would cooperate to fight terrorism and violence.” How could a demilitarized state fight terrorism? How do you think the Palestinians would agree for demilitarization, and if they don’t trust their neighbor, and this distrust continues for years and years? Sergei Strokan: I think a lot will depend on who will have the upper hand in the intrapalestinian struggle. I am speaking about Hamas, about their regiments, about their brigades. So how can you apply the term demilitarization to structures like Hamas? This is nonsense. Ekaterina Kudashkina: If we look at the experience across the Middle East, there have been some cases where previously extremist, militant organizations have become more or less legitimate political players. Take Hezbollah, for example. They are reducing their military wing, and they are entering real politics. Sergei Strokan: We have not touched upon the Hamas stance on the Palestinian issue. So far we were saying that President Abbas was going ahead with his initative of recognition of the Palestinian state within the borders of 1967, but this idea is rejected by Hamas, because if implemented, this will lead just to peaceful coexistence between the two states, Palestinian and Israeli, and Hamas denies the very right of Israel to exist. That is why Hamas is not interested in this type of recognition that Palestinian authorities are now seeking in the UN General Assembly. Ekaterina Kudashkina: Even if Hamas were not there, you would not be able to demilitarize Palestine, on the mere grounds that terrorism is on the rise, across the whole region, and no sane state would agree to demilitarization in those conditions. Sergei Strokan: But there is no other option. The second point of the alternative resolution if it is submitted to the Security Council, should make provision for strict security measures so that Israel should not become a subject of further attacks from the Palestinian territory. You can’t achieve this goal without demilitarizing Palestine. Ekaterina Kudashkina:No, I strongly disagree with you.I don’t think that it is ever viable for a state with no military structures to oppose the terrorism threat, to get control over extremists; military structures are essential. Sergei Strokan:Does that imply that he, too, is not optimistic about what’s going on in the UN now? Sergei Strokan: Recent polls show that about 70 percent of Israelis support the two-state solution. Ekaterina Kudashkina: I guess we should look at it in the regional context. The general trend over the years and over the region has been a rise in nationalism. And the Arab revolutions are just more proof to that. Nationalism is a desire to see your nation standing higher, but as soon as you get a desire to suppress other nations surrounding you, that is what I call national chauvinism. That is what standing in the way of every peaceful development including the situation between Israel and Palestine. Sergei Strokan: Obviously national chauvinism kills any moves to reach long-lasting solutions. Ekaterina Kudashkina: As we have been witnessing not only in the Middle East, but everywhere, including in Europe, the post-Soviet space. We’ve tried to look into the issue with Gershon Baskin, CEO and founder of the Israel/Palestine Center for Research and Information (IPCRI). Is my understanding correct that over those years, over the past decade nationalistic feelings have become somewhat stronger in Israel? Gershon Baskin: Yes and no. It is true that Israel is right wing today, but also 70 percent of the Israeli public supports recognizing the Palestinian state, so it is quite complex. Ekaterina Kudashkina: Nationalism usually stands in the way of rational and well-weighed decisions. Gershon Baskin: We have a situation in the Middle East today, where a nation’s honor is becoming more important than sound rational, reasonable politics. Look at the relationship between Turkey and Israel, that is an example – these are two nations who are willing to sacrifice the good relations that existed between these two sides in the name of honor or nationalism, and that is a pity. National honor is important, everybody wants to be proud of their country, no one wants to be humiliated, and international relations have to be carried out with a certain level of mutual respect for each other, but what is also important in the international relations is the interest of each party, and they always try to find mutual interest, so that each side comes out as a winner. Ekaterina Kudashkina: In the third section of our program we are going to look at someone who has challenged nationalists in one of the former Soviet republics – Latvia. Our Face in the News this week gives us a rare chance to speak of the post-Soviet space and a generation of new leaders, who are raised after the fall of the iron curtain and the collapse of the world communist system. 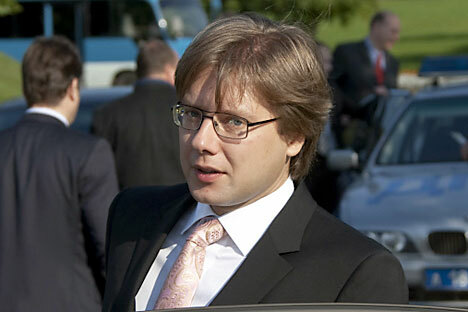 The face we are going to talk about today is Nils Ushakov, a native Russian from Latvia, the 35-year old mayor of Riga and head of the “pro-Russian” Harmony Center party, which came in first in the recent snap parliamentary election, achieving a success never seen in the history of independent Latvia. Ekaterina Kudashkina: Latvia’s snap election came after years of looming economic crisis, dirty politics and the dominance of oligarchs that resulted in the utter dissatisfaction of man in the street and evoked an avalanche of feelings. Sergei Strokan:I spoke to a colleague of mine who came from Latvia the other day, and she says that people there are desperate for better life, desperate for changes. And they still didn’t lose hope that one day changes will come. There is more public demand for leaders like Ushakov. Ekaterina Kudashkina: Analysts are debating how this win will alter the future of Latvia. And there is also another point—this former Soviet Baltic republic, which gained independence two decades ago to integrate into Euro-Atlantic structures, finds itself at another crossroads, as it was shortly after the collapse of the Soviet empire. Sergei Strokan:I think it is quite appropriate to call it “crossroads” as the surprise win of Nils Ushakov’s party was met with much enthusiasm by Latvia’s Russian-speaking minority. However, still there are more questions than answers. At the same time, it is quite clear that Latvia is entering into a new phase of its post-communist development. The new phase brings to life new political forces and new faces in politics, like Mr. Ushakov, who first made headlines two years ago, when his Harmony Center party delivered a crushing blow to Latvia’s ultra-right party “Civil Union” led by Geert Valdis Kristovskis at the Riga municipal election of June 2009. Ekaterina Kudashkina: The defeat of leading nationalist party has paved the way for Nils Ushakov to secure the crucial position of Riga’s mayor, adding him to the big names of Latvian politics. And from the very start, he showed that he was not scared to face ultra-nationalists and former Nazi collaborators, including Latvian Waffen SS veterans who stage their noisy marches in Riga. And people were quite receptive to the new policies. That means that they are tired not only of the economic hardships, but also of the nationalism, which is quite unnatural, I believe, and irrelevant, and it doesn’t yield good results. While drawing a line under the first stage of Latvia’s independence, which passed under the noisy slogans of battling with the ghosts of the Soviet past, Nils Ushakov and his party will have to look into the future. Sergei Strokan: They have no option. They have to make Latvia “a home for all”. As in the Middle East they have to make the region “a home for all”. For them in Latvia it will be another uphill battle – battle for Latvia’s future, as it is the case with the Middle East.